After spending several weeks tinkering with my Big Picture and Steam Link setup, and trying out the first-party controller options from Microsoft, Nintendo, Sony, and Steam itself, I’ve come to the conclusion that the Dual Shock 4 from the PS4 is the best controller to use with Steam. Why? It’s all about hitting that sweet spot between comfort and functionality. But before I make the case for the Dual Shock 4, I should tell you why the official Steam Controller isn’t the obvious choice. When Valve first sold the retail gadget in 2015, its wild design turned heads. While using mostly conventional shape, the Steam Controller did away with the standard D-pad and a secondary thumbstick, elements of controller design that have been more or less set in stone for almost two decades. It replaced them with two huge circular touchpads, one of which is bare like a laptop touchpad, and one that has a cross-shaped groove to help ease the loss of those cardinal buttons. It also includes two “paddles” that the player can grip with their ring and pinky fingers, which are otherwise unused by conventional controllers. Earlier iterations that Valve tested were even more extreme. 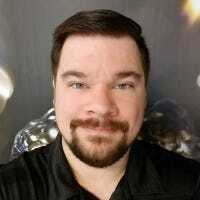 The idea was to create a blend of form factors, allowing the user to control both standard console-style games (third-person action, fighters, racing games, et cetera) and games designed primarily for mouse and keyboard (shooters, top-down strategy, MOBAs) with equal precision. 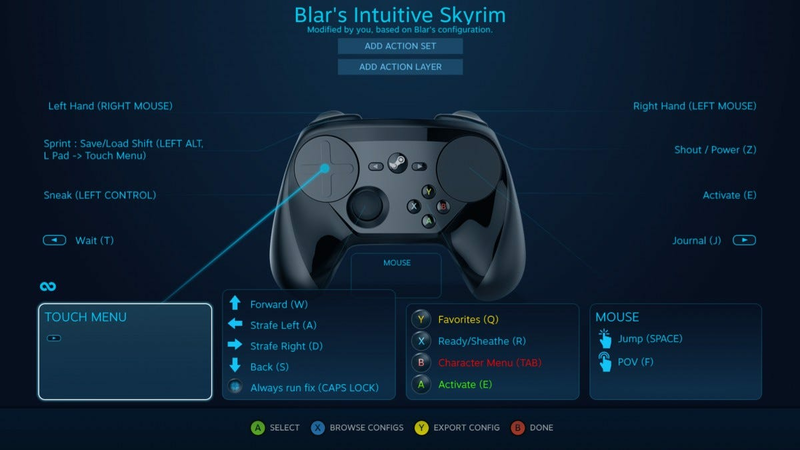 Valve has been tweaking the controller software, built in to the 10-foot Big Picture Mode interface and accessible to the user to an unprecedented degree, since launch. And indeed, the Steam Controller does an admirable job of controlling PC-style games without a mouse or keyboard, in ways that many skeptics thought simply couldn’t be done. The exposure of incredibly detailed and flexible customization options to players, and giving them the ability to save and share those options, is spot-on. But even so, the Steam Controller is a study in compromises. However close it gets, it can’t match up to the precision and (arguably) comfort of a true mouse and keyboard setup, for which so many PC-exclusive games are designed. And in making concessions to those PC games, it’s made playing console-style games much more problematic. Using a touchpad for camera controls instead of a second thumbstick is awkward at best, debilitating at worst. And the subtly altered geometry of the Steam Controller, which thrusts up the handles to insist that the user’s thumbs to rest on both touchpads and reach for the left thumbstick and A/B/X/Y face buttons, makes extended play sessions of console-style games much more uncomfortable than they are with a less innovative design. In short, the Steam Controller is a jack of all trades, functional for both PC and console controls, but excelling at neither. And while that’s a decent position to be in, it’s not ideal in today’s market. With so many PC gamers using some kind of console-style controller (typically the Xbox 360 or Xbox One design, the de facto standard), almost every major release includes baked-in console controls that don’t need any of the intense customization the Steam Controller insists upon. 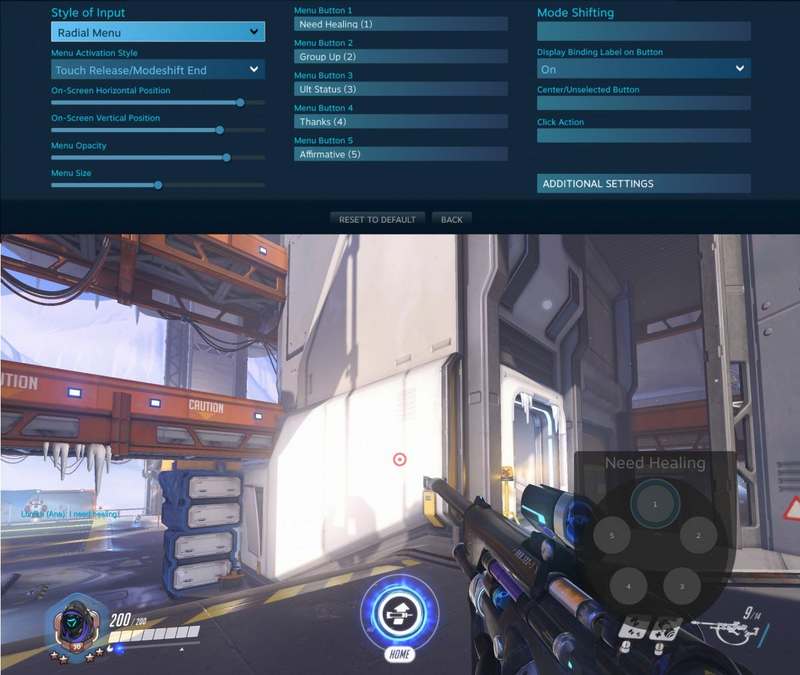 Even first-person games that are clearly better-enjoyed with a mouse and keyboard, like Overwatch or Fallout 4, include support for console controllers. Part of that is because those publishers also release the games for consoles—it’s an easy thing to copy the control scheme from one platform to the other. But part of it is because they know plenty of PC players simply prefer console controls, either because they’re playing in the living room or because it’s what they’re comfortable with. Another consideration is that there are now plenty of wireless “gaming” mice and even a few wireless gaming keyboards, making the full PC gaming experience available (if not perfect) in the living room and on larger screens. With these factors giving players more options than ever before, the Steam Controller is too much of one and not enough of the other. So if you don’t use the Steam Controller, what should you use? The Xbox One controller is the probably the most obvious pick. 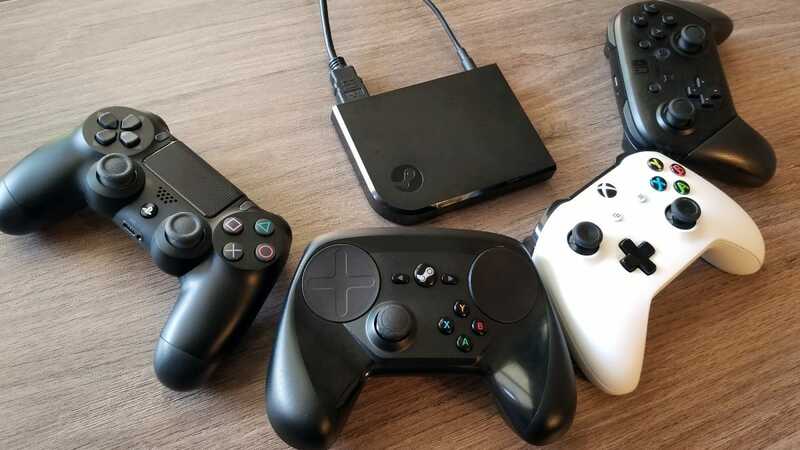 It’s officially supported by most Steam games, and its first-party wireless adapter or Bluetooth connection (for the One S model) is excellent. The Switch Pro controller is nearly identical, with the same button layout plus a gyroscopic sensor. Both are supported by Steam Big Picture, with full customization of the controls for each game available, plus custom binds, macros, and profile-shifting button combinations. The options aren’t quite as limitless as the Steam Controller, but they’re still excellent. You’ll be able to play pretty much anything, including mouse-and-keyboard games, if you tinker with the settings enough. But for the money, Sony’s Dual Shock 4 beats them both. It includes the standard combination of face buttons, shoulder buttons, and thumbsticks. It has gyroscopic controls from the Switch Pro, and it’s more solid than the Xbox One controller with a built-in rechargeable battery. But the big plus is that, in addition to the standardized layout that the Steam Controller lacks, it also has a built-in laptop-style clickable touchpad. The touchpad isn’t as sensitive or as flexible as the ones on the Steam Controller. It’s not a true replacement for a mouse—it feels like something you’d get on a cheap Dell from 2002. But for adding that extra bit of flexibility in games that aren’t perfectly adapted for console controls, it gets the job done. 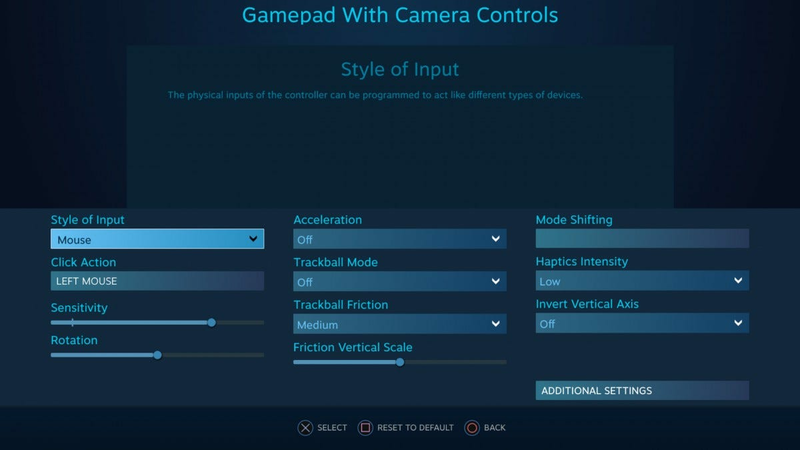 Enabling mouse controls on the touchpad via Big Picture Mode’s control customization is an easy add-on for any game, and it won’t take away from the buttons you need for standard console controls. (By default, Steam Big Picture emulates the mouse on an Xbox controller by pressing the central button and using the right stick, which can de-pair the controller if you’re not careful.) I’ve found the touchpad particularly useful for running emulators through the Steam Link: setting up mouse controls allows me to adjust graphic and input settings without running into my office to do everything on my PC directly. If you don’t need mouse controls, Big Picture Mode still lets you put the extra touchpad to good use. You can set the touch controls to act like a scroll wheel, set touchpad buttons in a grid or radial pattern for rapid selection of weapons or groups, or simply set the touch or the click functions to a single button. You can even split the pad into two separate controls zones, doubling up your control options depending on which thumb you use to reach it. Big Picture’s deep customization options give the user an amazing amount of flexibility. The Dual Shock 4 can replicate most of the Steam Controller’s touch functions without sacrificing comfort. Because of the extra customization options beyond the basic inputs of the Xbox and Switch controllers, and the superior comfort and standardized ergonomics that beat the Steam Controller, the Dual Shock 4 is hands-down the best option for PC players using Steam. 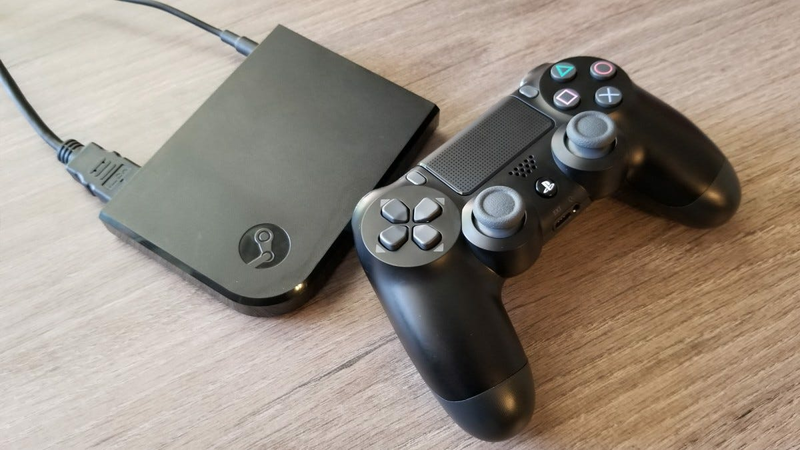 That’s true for both standard Big Picture Mode on the desktop and streaming via the Steam Link—both modes support the Dual Shock 4 by default, and plenty of DS4 users have uploaded their customized controller layouts to Steam’s shared database. If you’re particularly fond of either the Xbox or Switch controller layouts, or you’ve come to rely on the deeper customization of the Steam Controller, you’re probably fine sticking to what you know. 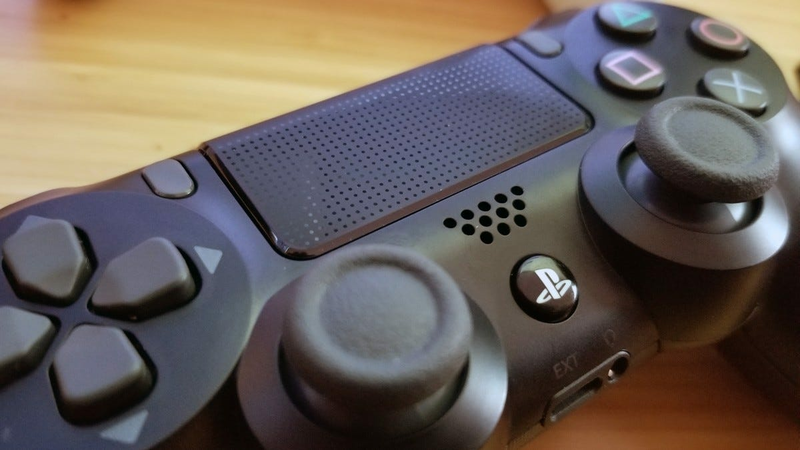 But if you’re looking for the ideal way to play with a controller while still having just enough PC-style control options, the Dual Shock 4 is the way to go.